Turnout in nuclear-armed North Korea's single-candidate elections hit 99.99 percent this year, state media said Tuesday -- up from a seemingly unimprovable 99.97 percent the last time they were held. 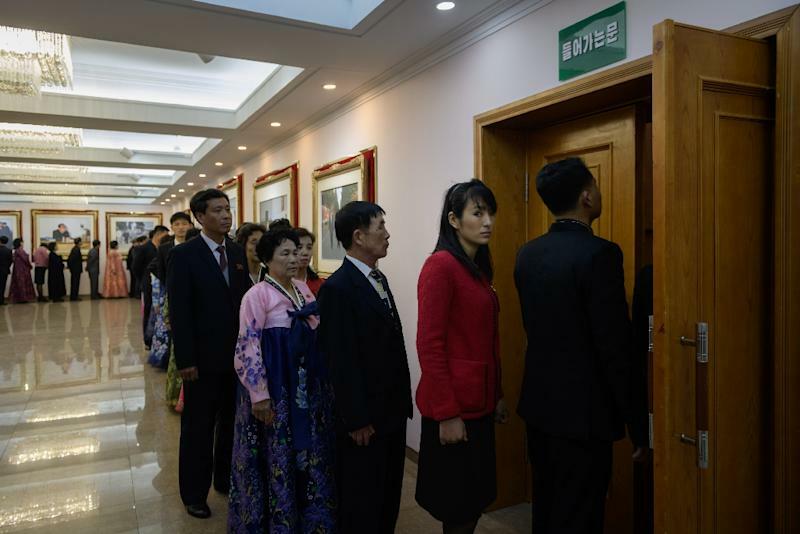 With participation figures that Western democracies would never achieve, millions of North Koreans head to nationwide polls every five years to elect the rubber-stamp legislature known as the Supreme People's Assembly (SPA). But with only one approved name on each voting slip in the isolated country, which is ruled with an iron grip by Kim Jong Un's Workers' Party, the result is never in doubt. This year's turnout fell a tiny fraction short of 100 percent as those "abroad or working in oceans" were unable to take part, the North's official KCNA news agency reported. "Single-minded unity" is one of Pyongyang's most enduring slogans and as in 2014, the votes were in the weekend elections were 100 percent in favour of the named candidates. "All the electors participated as one in the election to cement our people's power as firm as a rock," KCNA said, citing a report released by the Central Election Committee. "One hundred percent of them cast their ballots for the candidates for deputies to the SPA registered in relevant constituencies," it added. A detailed list of the 687 candidates was not immediately available, but the North's official Korean Central Television on Tuesday read out the names of elected members. Surprisingly Kim Jong Un's name was not among the called, an official of Seoul's unification ministry in charge of inter-Korean relations told AFP. In 2014, Kim received a 100 percent turnout in his Mount Paektu constituency, with 100 percent in favour, according to KCNA. Kim's apparent exclusion was "unprecedented" and "puzzling", said Lim Eul-chul, professor of North Korean studies at Kyungnam University. "While it's hard to say conclusively, Kim could have calculated it would make the country look more like a normal state if he didn't carry an extra title of deputy to the legislature when he already holds the country's highest rank," he continued. Kim is officially chairman of the Workers' Party and chairman of the State Affairs Commission, the top government body, although his late grandfather Kim Il Sung remains the country's Eternal President despite dying in 1994. The current leader's younger sister and close aide Kim Yo Jong was among the newly elected SPA members, the South's Yonhap news agency reported, citing Pyongyang state media. Critics say the North's election -- with its total absence of electoral competition -- is largely a political ritual to enable the authorities to claim a mandate from the people, while reinforcing loyalty to the government. After casting his ballot on voting day, Pyongyang resident Ri In Yong, 61, told AFP the election was and "occasion to demonstrate to the world the single-minded unity around the Supreme Leader comrade Kim Jong Un". Ordinary North Koreans always express unreserved support for the authorities when speaking to foreign media. "In other countries they select and vote for candidates from different parties with different political views," Ri said. "In our socialist system the people vote for the candidate."